Integrating events from pop culture with your curriculum is an excellent way to connect with and engage your students. 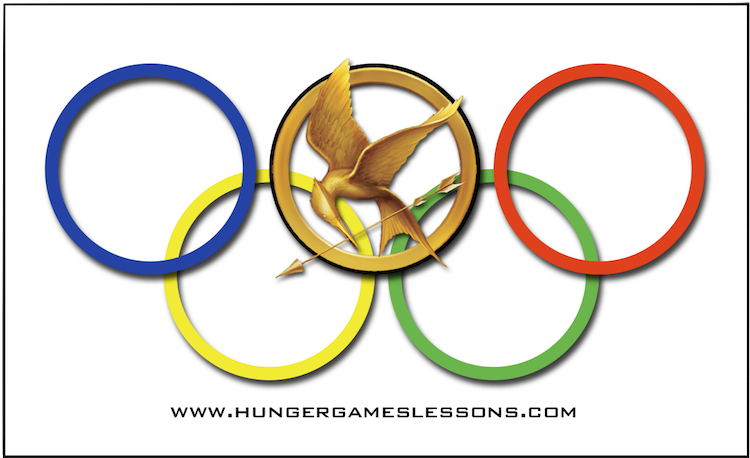 So whether you are currently teaching summer school, or just planning ahead for this fall, you can utilize the Olympic Games for class discussions and mini-research projects. In chapter two of The Hunger Games by Suzanne Collins, the District 12 citizens give Katniss the three-finger silent salute: a gesture that shows thanks and respect her for her sacrifice. (p. 24) In the movie, Katniss gives the District 11 citizens the silent salute after Rue's death and they return the gesture. Note: In the novel, Katniss tells them thanks for the bread, but does not give the three-fingered silent salute. (p. 239) At the time, Katniss realized that she had publicly displayed rebellion toward the Capitol's mores by honoring and adorning Rue's body with flowers. In turn, District 11 defies the Capitol by sending Katniss bread (or saluting her, as shown in the movie). These are public acts of rebellion toward a repressive government. So...how does this relate to the Olympics? • What did Smith's and Carlos' gesture represent (or symbolize)? • How did the public react to their gesture? • What repercussions did they suffer because of their gesture? • How does their statement (or form of rebellion) compare to Katniss's gesture of rebellion in The Hunger Games? 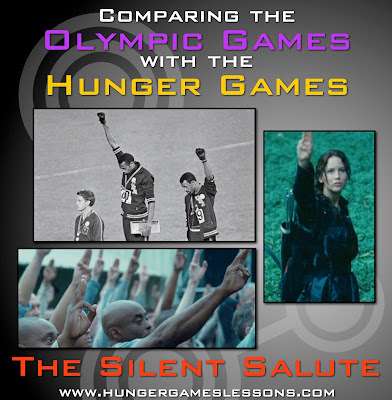 • How does it compare to the silent salute by the district citizens of Panem? • Would Smith's and Carlos' gesture get a different response today? Why or why not? This is a great cross-curricular activity with the history department. Students who are studying the Civil Rights Movement can offer insight about the atmosphere around the world at that time: the TET Offensive in Vietnam ushered in the new year, both Martin Luther King, Jr. and Robert Kennedy are assassinated, the Soviet Union invaded Czechoslovakia, and a myriad of student protests erupt both in America and Europe over the course of the year. 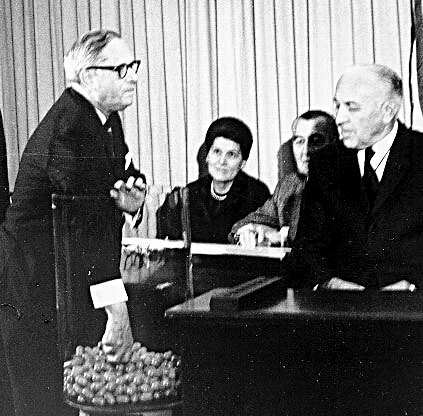 For further discussion, compare America in the late 1960s with Panem. 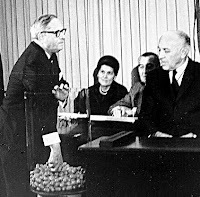 • What is the difference between the Hunger Games reaping and the 1969 Vietnam Lottery Draft? • How were the youths who rebelled against the draft treated by the government and/or the citizens? • How does this differ from the way Katniss is treated when she rebels? Would it make a difference if the "draft dodgers" were women? Would they be treated differently? • What if Peeta led the rebellion? Would he have a similar reception to those who rebelled against the Vietnam war? For further enrichment, have students study the images from the 1936 Berlin Olympics. The German athletes give their own "salute" for Aryan supremacy. Despite warnings of Hitler using the Games for political propaganda and threats of boycotting, the Games went on and the Germans were not reprimanded for their public display of supremacy. (Source: NPR Nazi Olympics Tangled Politics and Sport.) Ask your students why officials would allow this, yet balk at the actions of Smith and Carlos? Top image: Art designed by Tracee Orman using photos from Lions Gate Movies® and the Associated Press (AP). Black Panther salute from the Guardian http://www.guardian.co.uk/world/2012/mar/30/black-power-salute-1968-olympics# Original caption: John Carlos (on right), Tommie Smith (center) and Peter Norman, who wore an Olympic Project for Human Rights badge in support of their gesture. When Norman died in 2006, Carlos and Smith were pallbearers at his funeral. Photo: AP.